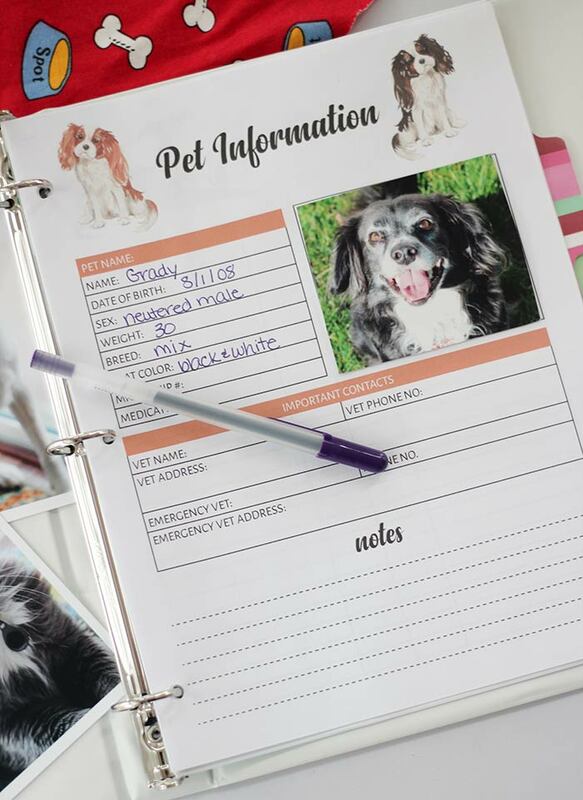 This printable pet binder is all you need to organize your pet's important records in one place. Our cat recently had to have some teeth pulled, and I came home with a stack of paperwork from the vet. I started to put it away in an already overstuffed file folder when I realized there had to be a better way to organize our pet records. This year marks the 10th anniversary of when we adopted our dog Griffey, and our cat Biggie and little dog Grady followed within the next 6 months (I know, we're crazy). Over the course of 10 years our three pets have accumulated a lot of records. I've kept it all in a file but it's become totally unwieldy, and I can never find anything when I need it. That's why I'm putting together a pet binder for all my animals' important information and I have it here as a printable for you too! Pets come with a lot of paperwork, from your initial adoption papers to vaccination certificates and everything in between. Over the course of your pet's lifetime this can add up, and if you don't have a place to keep it all you can quickly get overwhelmed! 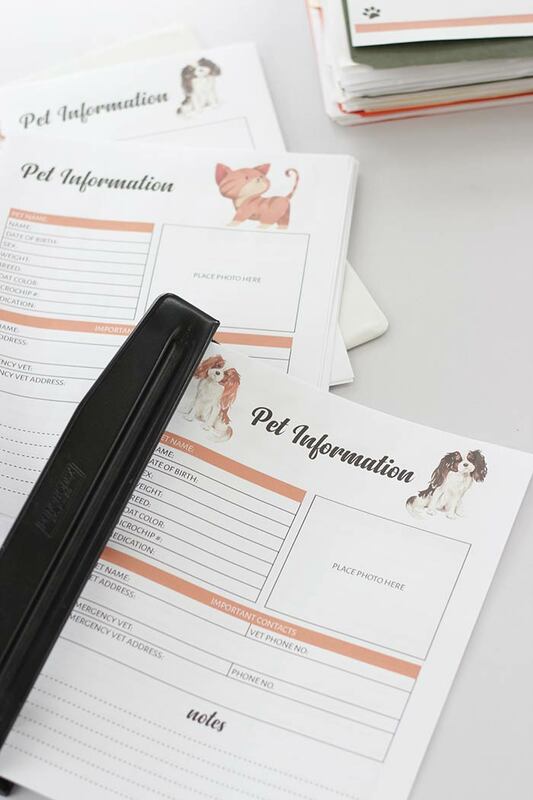 It's important to know how to organize pet records so that you have all your pet's important information in one place where you can easily locate it when you need to. I have everything you need to do this in a super cute printable pet planner that works for dogs and cats! 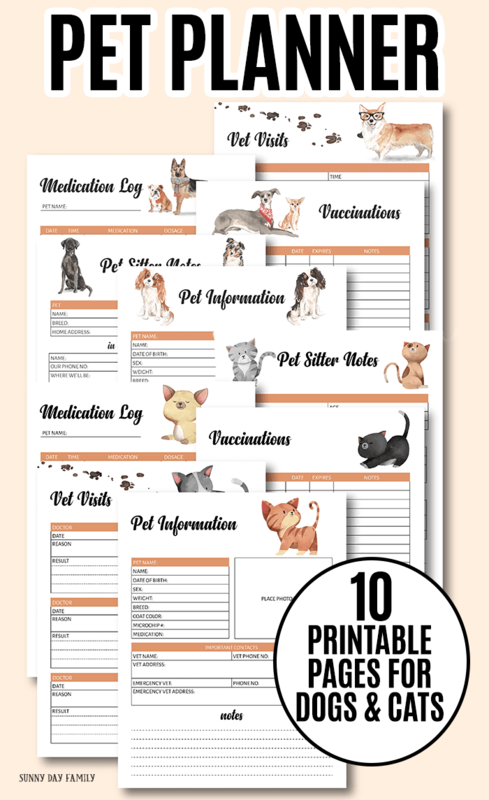 This printable pet planner includes 10 printable pages plus a cover page. There are 5 dog themed and 5 cat themed pages that you can mix and match to what works for your family. Here's what you'll find inside. 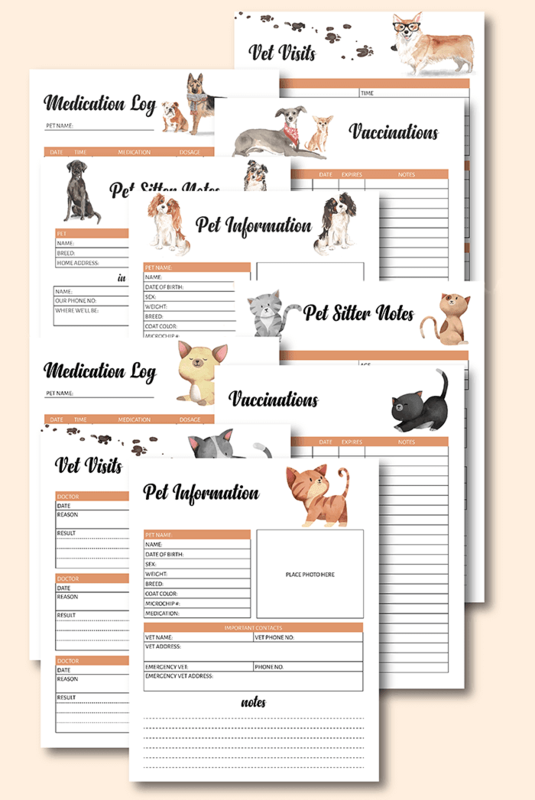 Pet Information Sheet to record your pet's vital stats, important contacts, notes, and a photo. 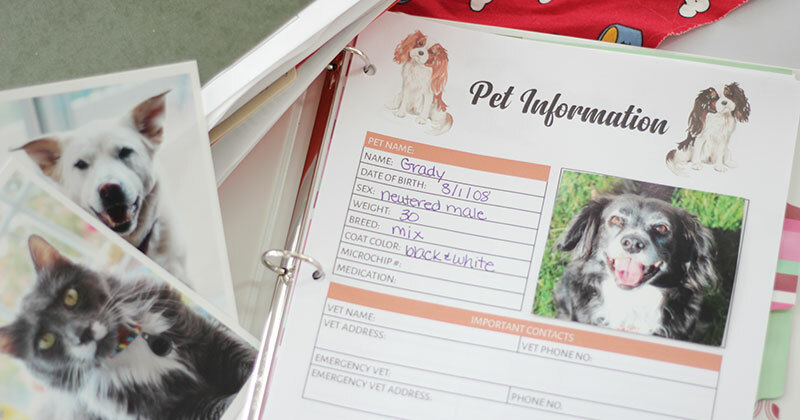 This page is vital to have on hand in an emergency or if your pet were to go missing. Vaccinations Log to keep a list of your pets vaccine dates and due dates. Medication Log to keep track of all your pets' prescriptions and preventatives. Vet Visits record to note check ups and sick visits so that you have their medical history in one easy to read format. Pet Sitter Notes to give caregivers instructions for taking care of your pets while you are away. 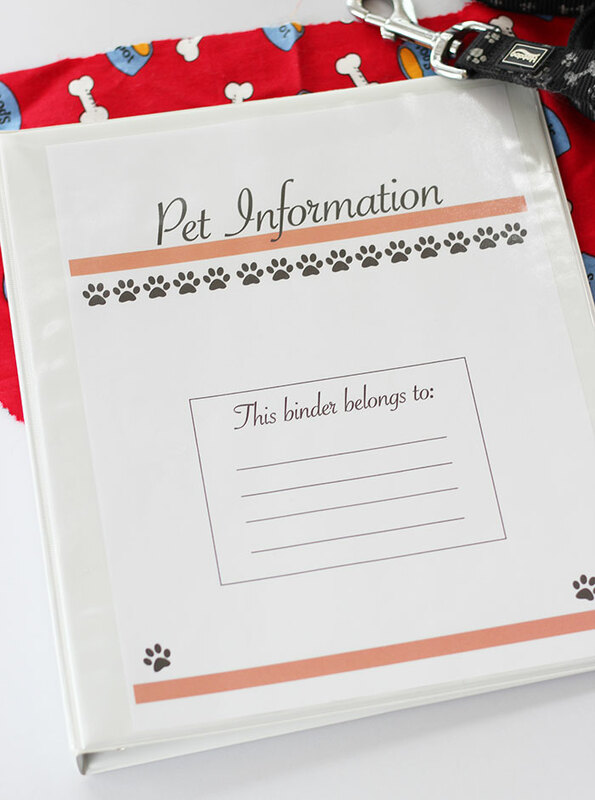 To get your own copy of this printable pet binder, simply click on the button below. Once you've downloaded the pages, you can print them easily on regular letter size paper. Print as many sections as you need for the pets in your family. I keep ours in a standard 3 ring binder with a slot for the cover page. I've added tab dividers to give each of our pets their own section. In the front of each section, I've filled out their pet information sheet, then placed the log pages and pet sitter notes next. Then, I keep vital documents that are important to keep on hand, such as their microchip registration information and current vaccine certificates. I've finally tossed all of our old vet visit receipts as I'm able to keep this information more easily on the vet visit notes pages. It really cuts down on the paper clutter and keeps everything I need at my fingertips. I love it! 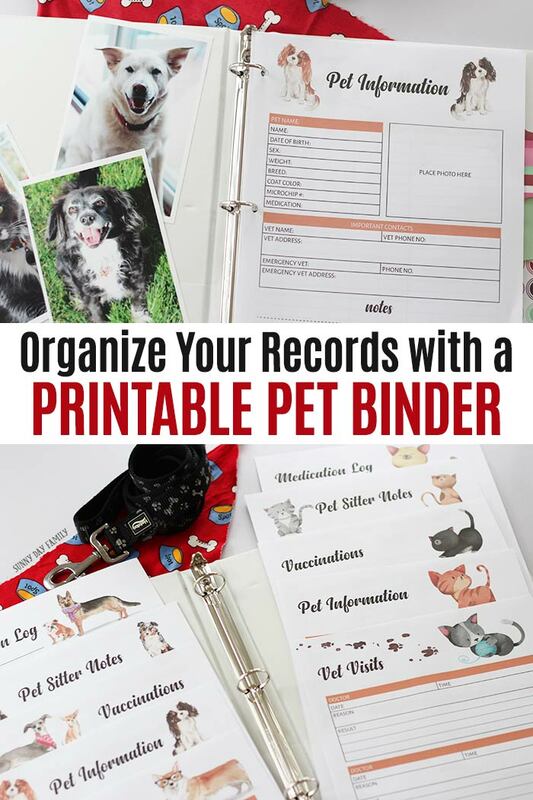 Ready to get your pet records organized? 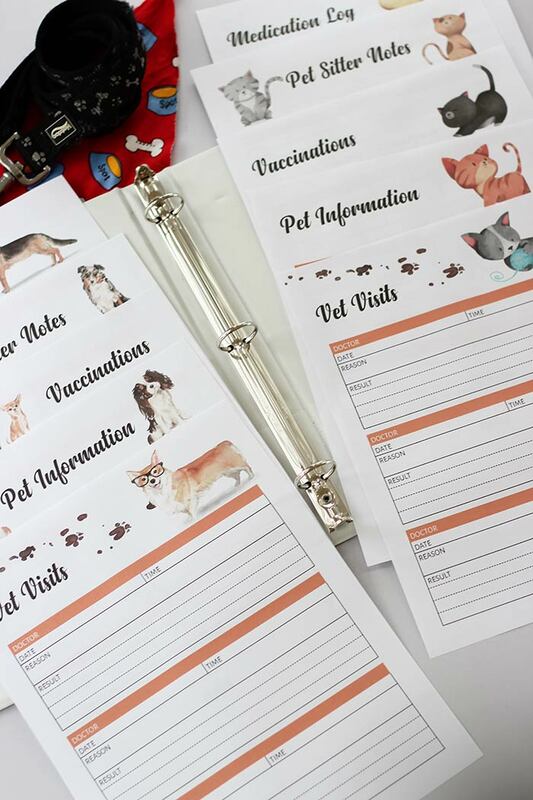 Grab the printable pet planner set by clicking on the button below!